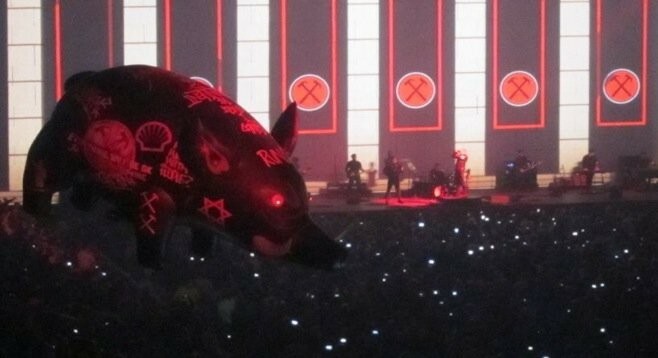 Inflatable Wild Pig prop for Roger Waters The Wall Live (2013) a.k.a. "Pig Drone"
“I had a lot of fun, until I noticed the Star of David, on the inflatable pig. That was the only religious-national symbol which appeared among other symbols for fascism, dictatorships and oppression of people. Waters crossed the line and gave expression to an anti-Semitic message, beyond all his messages of anti-militancy"
The Elder of Ziyon blog posted a video of this spectacle on You Tube labeled "Pig Drone"
Roger Waters fans would rightly point out that Pink Floyd's album "Animals" (1977) featured an inflated pig. 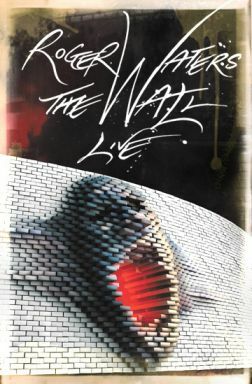 Moreover, the prop was used during the "Run Like Hell" song from "The Wall" (1979), which was written from the point of view of an anti-hero who imagines himself turning into a Nazi dictator. Todd Gutnick, the director of media relations at the British Anti-Defamation League, seemed unconcerned that the Star of David on Water's inflatable pig had an anti-Semitic intent. Gutnick noted that Waters has been doing the same thing for years. Gutnick observed: "For this most recent tour, the pig appears to have numerous symbols, including a hammer, dollar signs, and sickle and a small Star of David." Moreover Gutnick noted that in the filmed version of The Wall (1982), mobs raid and destroy the homes of blacks and Jews, so the imagery is consistent with the intent of the song. 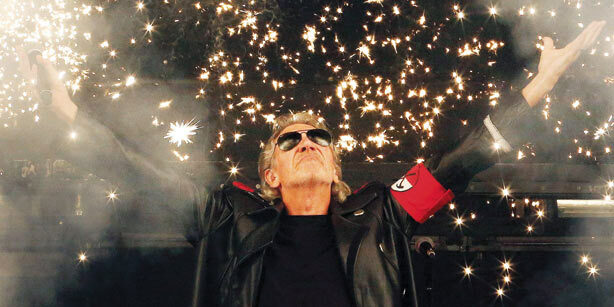 Roger Waters in fascist costume during a live concert of "The Wall"
Delving into the intent of the imagery, the symbols are supposed to represent fascism, dictatorship and oppression of people. Of course, the Star of David was the only religious-national symbol. These images displayed on dirgibles have not been static. One former fan complained when "Bush" was scrawled on the porcine balloon during a prior US tour. So to keep current and live on the artistic edge, Waters might have included a crescent to depict the authoritarian impulses of Islamists who seek to impose a sharia compliant Caliphate on the world. But that would be at varience with Waters' stated political opinions. Roger Waters has released "A Song For Palestine", which shows where he stands on politics in the Holy Land. Waters has been a vocal proponent of the Boycott Divestment and Sanctions effort against Israel. During an interview with Electronic Intifada in March, Roger Waters claimed that: "[T]he Israeli government runs an apartheid regime in Israel, the occupied territories and everywhere else it decides.” He has encouraged other artists like Beyonce to boycott Israeli appearances. But if Roger Water's animus is only against Israel as one of the powers that be , this distinction seems to be lost on the general public. Some comments on the You-Tube "Pig Drone" video felt into typical anti-semitic smears. This sort of reaction is unsurprising. Rabbi Cooper opined that: “Waters deployed a classic disgusting medieval anti-Semitic caricature widely used by both Nazi and Soviet propaganda to incite hatred against Jews.” The imagery may be old in basis and nothing new for Waters' theatrical concert experiences. But at a time when the world is in turmoil with war on several fronts in the Middle East and a shaky financial system, many may look for scapegoats and Jews are easy targets.